This is a photo I took a couple of days ago. 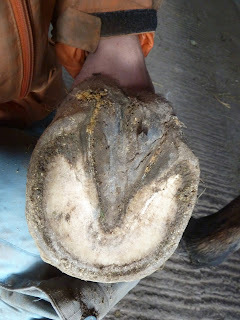 The hoof always gives you a lot of clues about the balance it is trying to achieve but one of the most obvious is the band of new growth at the top of a healthy hoof. Flynn has been here for just over 10 weeks and there is lots of good growth visible. The new growth makes it easier to see the balanced hoof Flyn is trying to grow and putting lines on the photo gives a clue as to the imbalances that have occurred in the past. If you look carefully, you can see that the new hoof growth won't be perfectly symmetrical and will have a shallower angle on the medial side, which is quite common especially in horses who've had past lameness issues. Looking at this photo from September, you can see that his long toe and under-run heel were contributing to his toe first landing and therefore stressing his DDFT and contributing to his lameness. This is the same foot at 10 weeks - a completely different profile and a completely different way of loading. 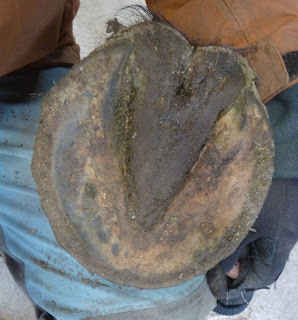 The heel and caudal hoof are going the right way although there is still lots of work to do. The sole shot of the RF - again comparing when he arrived in September with today. On arrival his hoof didn't look too bad but if you compare the proportions of his frog, toe and heel the development is obvious. Don't ignore the bars, either - in the first photo they are longer and provide stability to a weak frog and sole. Now, they are much shorter because the foot is stronger. Hoof balance is not about the perfect looking hoof, its not about set angles, its not about making a hoof fit into a mould or even my preconceived idea of what it should look like. 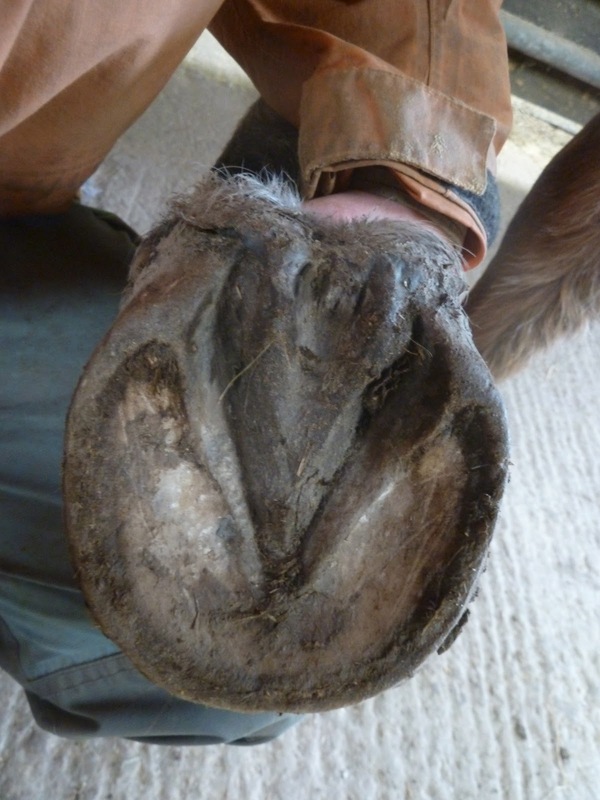 Its about one thing only - the most supportive, well developed, robust and effective hoof for the horse. And guess what? They normally know exactly what they need to do. These hooves belong to Nico, a 6 year old TB x Polish warmblood who arrived last Wednesday, thanks to the commitment of his owner (as always!) and the support of his vets and his insurers (AND their external veterinary consultant, which I think is a first!). He is only 6 years old but has had a complicated lameness history, beginning with problems on his hind suspensories and ending up with bilateral front limb problems, which blocked to the heel/caudal hoof. He'd been shod with remedial half shoes and a gel filler behind and his owner says these have improved his heels and his soundness. I can believe it, since they are allowing for more caudal expansion and contraction than full bar shoes and are also supporting his frogs. She has however made the brave decision to try to rehab him barefoot in the hope of improving his lameness at a more fundamental level. Here are his feet 4 days later - and the plateau at the toe is the last that is left of the dead sole that was lining his feet. Its so soft you can lift and peel it back and of course its wearing away rapidly (I haven't trimmed it, though in a different environment he might be a candidate for a trim!). Despite the long hoof wall that is still there at his quarters, the hoof is looking different already. This is the sort of hoof that many would say is "too short", and "needs shoes". 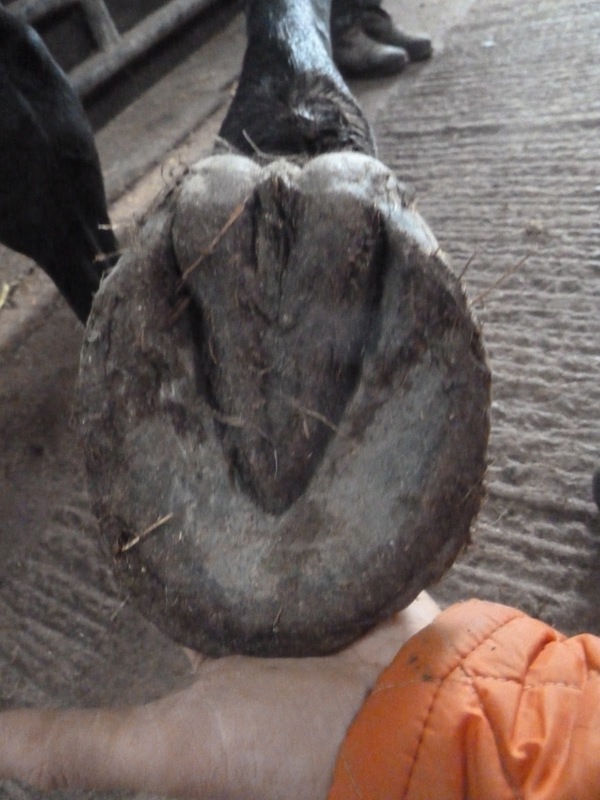 But the sole view gives a different interpretation: despite the cracking, there is no damage to any sensitive structures and you can see the chips and splits are only where hoof wall is long, especially on the lateral (RH) side. In fact this isn't a foot which is too short - its way too long, especially given the dead sole you can still see at the toe. 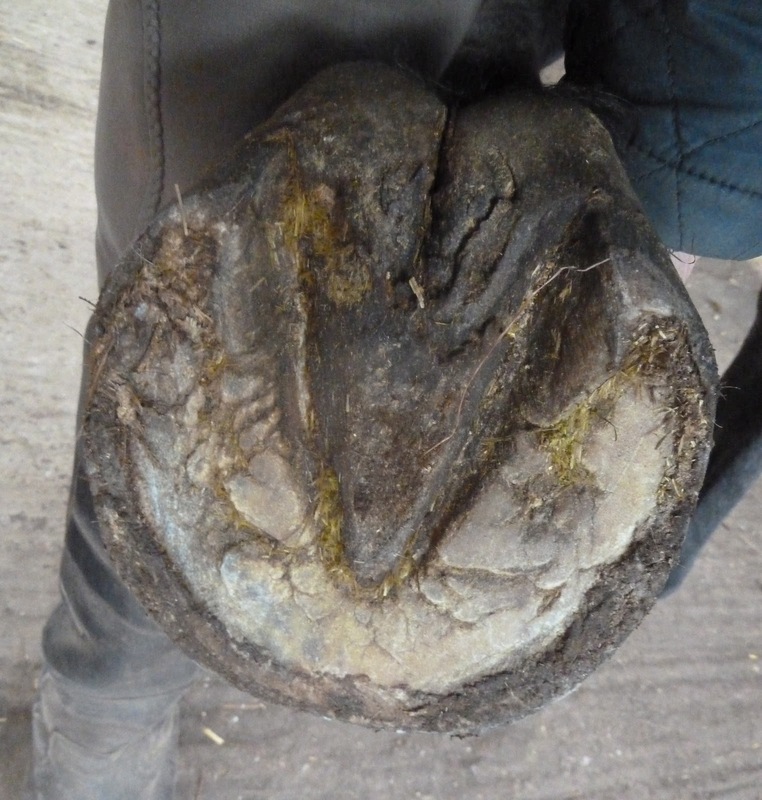 What is brilliant is that the farrier has not over-trimmed either sole or frog, and its this, plus his gel inserts which gave some stimulus to the caudal hoof, which I suspect has helped Nico to remain comfortable out of shoes. Looking at the same foot from the front, the fact that its long becomes more obvious. The tilt in the hairline (as well as the orientation of the frog and heels above) is a clue that his medio-lateral balance may be off but there is masses to like about these hooves even after only a few days, and the length, as you can see, is sorting itself out quickly and easily. I'm just in the throes of updating the Project Dexter info - the details on horses who have been diagnosed with navicular/DDFT/collateral ligament damage and assessed by their vets against the project's standard lameness assessment since 2008. The exciting news is that there are now 39 horses within the project - of course some are still undergoing rehab but its encouraging that the majority are all back in work. Most are working at the same level or higher than before they went lame; there are 2 who did not come back into work, though they improved and one who still has intermittent issues. Big thanks to all the owners, vets and even the odd insurance company who have helped make the project a reality. I'll carry on collecting the info and it will also go out to the vets as soon as I've finished the current update. I posted yesterday a little bit about hoof balance - its a massively complex subject which is hard to do justice to in 2 dimensions but I hope the first instalment was useful and I will post follow-ups soon, as there are lots of other visual clues which can help you assess how well (or not) a hoof is balanced. On the subject of hoof balance, Zan is a very interesting example. I have put lots of posts up about him before and you can see an example of how his hooves have changed here and the effect its had on his limbs here. Zan is a good example of how dynamic hoof balance has to be. His limb conformation means that if you impose a symmetrical hoof on him, he can't land properly. Conversely, if you allow him a hoof on which he CAN land properly, its asymmetric and looks odd when he is standing in front of you. He is much sounder this way, however, so (in his case) you have to take your pick: pretty hooves and lame horse or strange hooves and much sounder horse. I know which I prefer and - more importantly - which Zan prefers. The footage here gives you an idea of how much twist there is in his front limbs. I took this a couple of days ago, just before Zan went home and although its lovely that Sarah has now found a perfect new yard for him, I must say we will all really miss him - he's been here such a long time that he's become part of the family. Good luck Zan and Sarah, and hope we will hear from you soon! "Osteo to see Bailey yesterday, she was very pleased with him and said it was the best she had seen him move ever. Sounder than a sound thing.lol. Was tight behind his ears, that's why we had no connection last week. So all sorted and very pleased that he strutted his stuff so well. Bless him. Long may it continue.x"
First off, what IS a balanced hoof? Well (within this blog, at least! ), a balanced hoof means only one thing: a hoof which is balanced for that particular limb on that particular horse. This means of course that hoof balance is unlikely to be the same for 2 horses - in fact its unlikely to be the same for 2 limbs on the same horse, given that horses, like people, are asymmetric. You can however get a very good idea of whether the hoof is balanced for the horse by assessing the horse's conformation, particularly the limbs, and by looking at the hoof capsule. This is obviously a hoof which is under inappropriate stress and which cannot currently support the horse correctly. Its important to remember that although the hoof wall looks solid and unyielding, its actually quite a malleable, plastic material. Think of a glacier - looks like a dense wall of ice but is constantly moving and responding to pressure - and a hoof is similar - always trying to support the limb in the most effective way. The same hoof from the sole gives us more of a clue as to what is happening. Drawing a line down the hoof highlights the fact that each half is completely different. 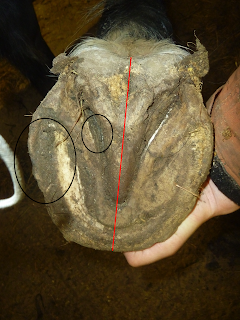 The lateral side (on the right of the photo) has a shallow central sulcus and the sole is level with the hoof wall. On the medial side there is a much deeper collateral groove and long hoof wall above the sole. 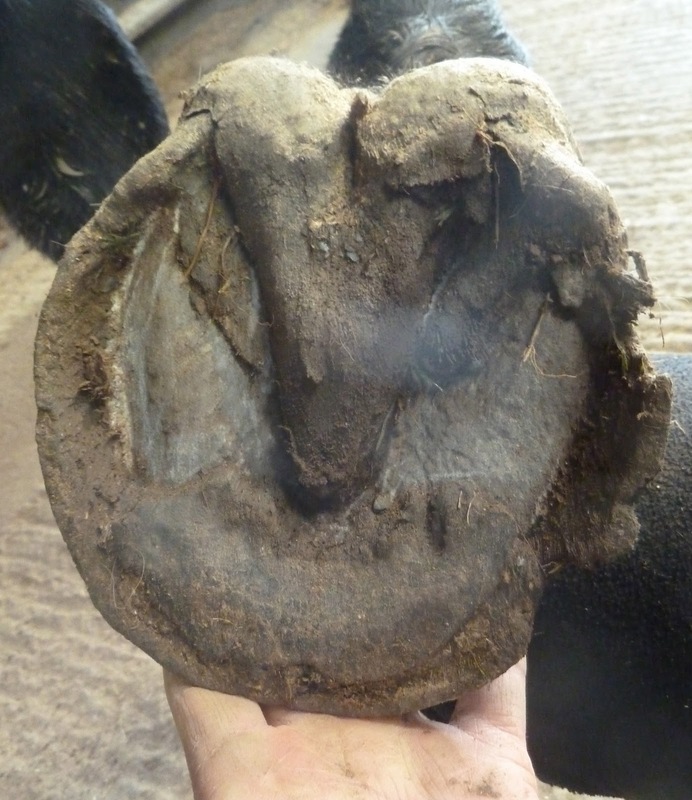 Basically this is a hoof which - internally - is on a tilt, hence the distortions in the hoof capsule. 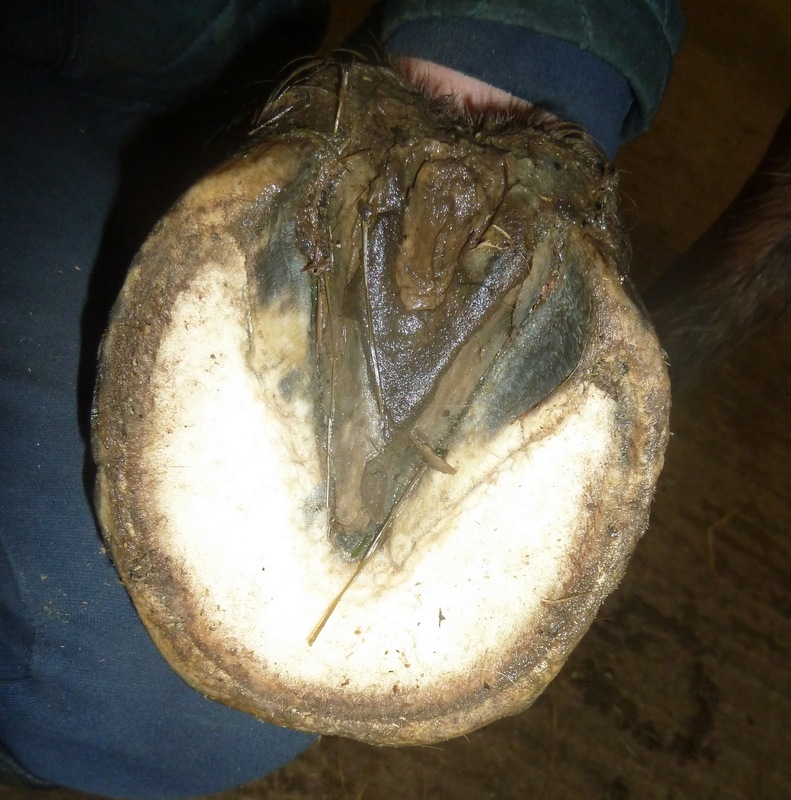 It wants to be level, and the hoof capsule wants to be supportive but at the moment there are too many stresses between the internal and external structures. I'll be posting more on hoof balance soon - there is masses to put up and this is only the first instalment! 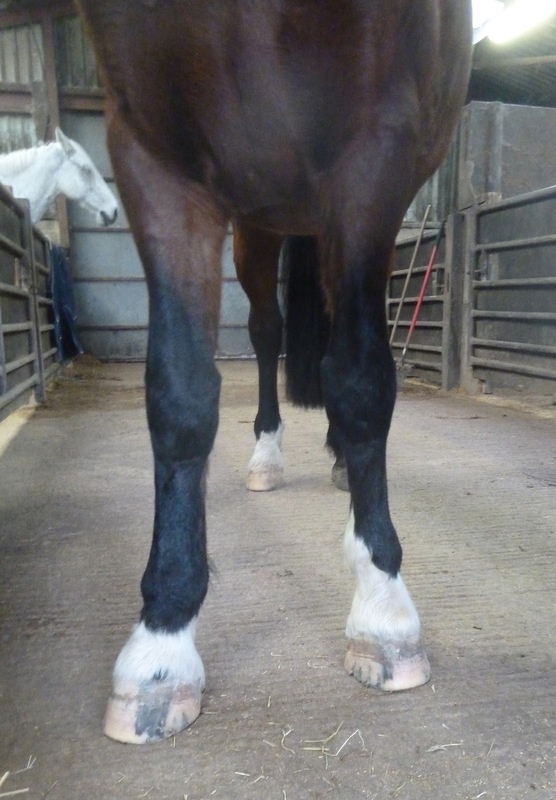 I am in the throes of doing a LONG post on medio-lateral balance for the hoof anoraks out there - it should be up later this week but its not finished yet...partly because I have been spending a few hours setting up the latest Useful Thing to hit Rockley. Its something I've had in mind for a while but when I last looked at it (nearly 2 years ago) the exorbitant expense ruled it out, especially for a remote location where wiring everything up wasn't an option. I investigated it again a couple of weeks ago, partly because with Paddy in the barn, needing regular check ups, I was looking for a way of monitoring him without having to be stomping up there in the middle of the night! 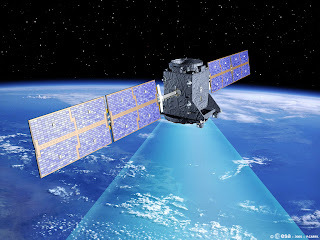 At the same time, the idea of having better security and monitoring was appealing and I found a company who specialise in wireless technology for locations which are off the beaten track. It's still relatively expensive but a whole lot cheaper than it used to be. Ted is a quarter horse who arrived on Saturday - in a nice piece of synchronicity he was brought down by Nicky's owners (she is another quarter horse) who took her home on Sunday. As you can see, he was shod in remedial shoes with gel filler and a wedge and he had also been on 5 weeks of box rest. Ted was diagnosed on MRI with bilateral DDFT damage, worse on his LF, and he has undergone surgical treatment as well as the farriery. He is on a fairly strict regime of limited exercise, as horses often are when they first arrive, but he is allowed out on the tracks and to mix with the other horses which he seems to enjoy. With the rest of the horses being very relaxed there is no great incentive for him to dash about and I hope he can now (literally!) start finding his feet. Its been a very busy weekend here, with Nicky going home and another quarter horse, Ted, arriving - there will be more on both of them later in the week but I've had an email from Terri to say that Nicky arrived home safe and sound and stomped across the stony carpark (which she used not to like!) so I'm hoping she goes from strength to strength. As well as that, Debbie came to visit Paddy and was delighted to see him so chipper; as she said, its hard to believe that he has just undergone massive surgery. He was on such good form and it was such beautiful weather that she had to work quite hard to restrain her enthusiasm and keep his daily outings to no more than the permitted ambles out to graze...We are both desperate to let him do more, which would be better for his hooves, but he can't be too active until his muscles have re-knitted after the wound has healed. As you can see from his initial photo (above) he had a weak frog and high heels, like so many horses, and its changing that which is the key for him, as he otherwise has good hooves. More importantly, even in the 2 weeks that he has been here his landing has improved, as you can see from the footage. 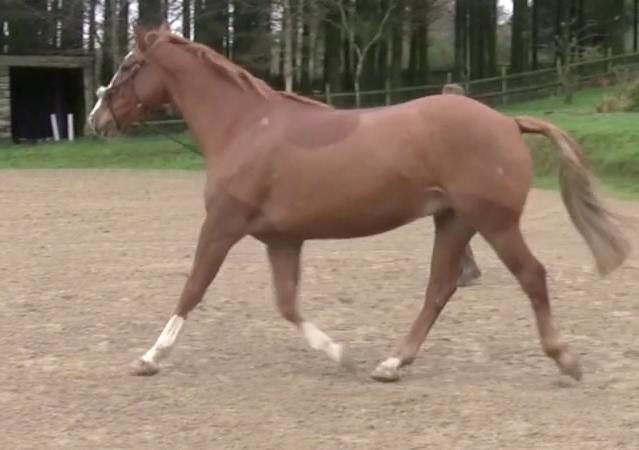 There is a long way to go before his front feet land as well as his back feet but he is getting on track and the improvement means that he can start proper work. Thomas has a huge work ethic and wants nothing more than to be busy, so I think he will be thrilled to have a proper job once more. 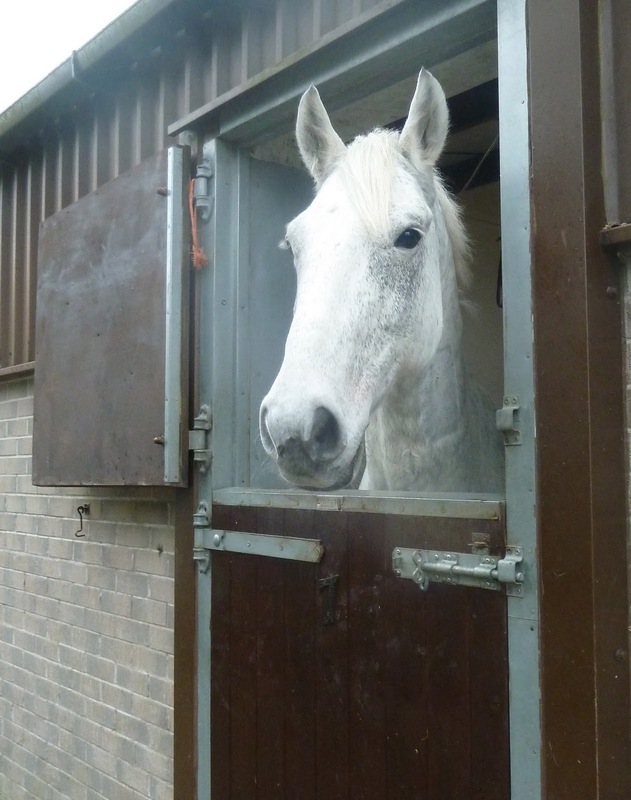 The latest horse to arrive at Rockley is Solar, who made the trip from Berkshire with his owner Sarah last Sunday. 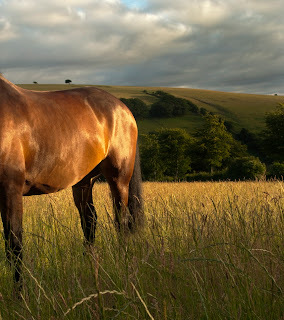 Sarah has known him for several years and recalls that he has had periodic lameness, usually when the ground is hard, but it was only once she owned him that she was in a position to do something about it. As you can see, there is a pretty clear issue with his medio-lateral balance especially on this - his worst - foot. There are also lots of growth rings and evidence of times when fairly dramatic shifts in his hoof loading have occurred. He is reluctant to load his RF and Sarah correctly assumed that this was because of ongoing discomfort even when some people were telling her is was just habit or that he was being awkward. As always, you rarely go wrong if you listen to your horse(!). Solar's farrier was well aware of the balance issues and the fact that he was loading incorrectly and was doing his best to correct it, as you can see by the fact that he has left the medial wall on both hooves much higher. However it does seem to be extremely difficult to rebalance feet this way, whereas if you aim to centrally load the foot through the frog, the hoof capsule usually has a better chance or adjusting. Despite the balance issues, there is a lot to like about Solar's hooves, and he has a fantastic frog and a pretty good digital cushion, so I am very hopeful that he will be much more comfortable soon. 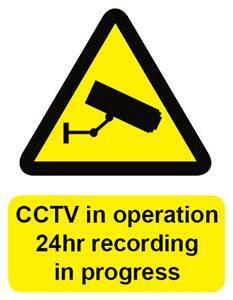 Footage to follow...! Last weekend I couldn't hunt on horseback (much to the irritation of Felix and Dexter!) but it was such a stunning day that I went on foot to the meet and took my camcorder. Hounds met in the Brendon valley and - if you overlook the presence of the odd car and quad bike - it was a scene which could have been last week or a hundred years ago. Charlie and Andy had a lovely day, of course, as I think everyone did. 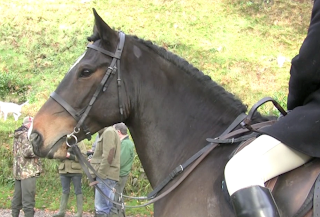 I've compressed a lavish 45 minute meet into 3 minutes of film but I hope you enjoy the clip - it makes for a fun Thursday film anyway - not much action but a timeless occasion when Exmoor and the foxhounds looked fantastic. I had a visit from Kate, Deborah and Mel - my lovely former students - last week, as they were keen to catch up on the progress of the rehab horses they already knew and meet the new guys. They always get roped in to helping me photograph and film the horses and this time was no exception. We started off with Mr Knightley who had at that stage been here for 3 weeks. An improved landing, going from toe first and intermittently flat to flat/heel first. Its still early days for him and he still has weak frogs so I would not expect a more definite heel first landing until he has a lot more good mileage under his belt. For good measure here are his hooves, above on arrival and below at 4 weeks. They bear out the changes you can see on landing and of course the healthier the hoof becomes, the better the landing should be. Although we are still fighting the central sulcus infection in his frogs, there is are also progress here, along with his high heels. Its interesting to see from this angle how high heels and long hoof wall were actually causing a medio-lateral imbalance, shunting the hoof capsule sideways and reinforcing the vicious circle of weak frog/caudal hoof pain - and of course putting strain on internal ligaments. With a healthier frog - or the beginnings of one, as we have a long way to go before that central sulcus infection will really be a thing of the past - the balance improves as well as the rest of the caudal hoof. Finally, I also have some footage of him on a circle - at just under 4 weeks into his rehab - so that Debbie his owner, who is in Dubai, can see the virtual Knightley even when she can't see the real one. As you can see, he was struggling with the fact that there was a howling easterly wind and the dogs of course chose the moment we started filming to have a wild, fast and extremely noisy game round the arena which he found rather alarming. Over time I would want to see a much more relaxed frame and better straightness and suppleness but the important thing for now is that he is happy to extend in front and land heel first, which is a crucial precursor to any sort of rehabilitative work. The rest will come with time and work. The foxhounds met up the road this morning and by the middle of the day they were hunting round and round Rockley :-) Its always lovely to hear them even if I am not on horseback. Charlie, Dexter and Felix were a little bit miffed not to be in the thick of it but they and the rehab horses all enjoyed the chance to watch the action from the track. Hounds coming through is just like widescreen tv for our horses - they don't gallop about, they just put their feet up and enjoy watching someone else doing the work. I am delighted, because the rehab horses are just where they should be - stomping on the pea gravel track and getting the best possible movement. On the plus side, the weather was glorious and the autumn colours are spectacular so when Andy took Charlie hunting on Saturday they were both very happy and it was an incredibly beautiful day. As I went to the meet on foot I took my camcorder and I am glad I did as it was one of the most picturesque on our calendar. I have some fun footage (quintissentially English, for all you Texans!) which I will upload later in the week. On the downside, much more seriously, Paddy had a bout of spasmodic colic late on Saturday, which has thankfully now resolved but which entailed another emergency vet call out and of course masses more worry for Debbie and the rest of us. There is a high chance for horses to colic post surgery - not surprisingly, as having your guts opened up, bits cut out, stuck back together and everything being stuffed back in leaves inflammation and adhesions which can cause issues over the subsequent weeks. For now, Paddy is feeling fine again, but please keep sending those good wishes because we all still need them(!). 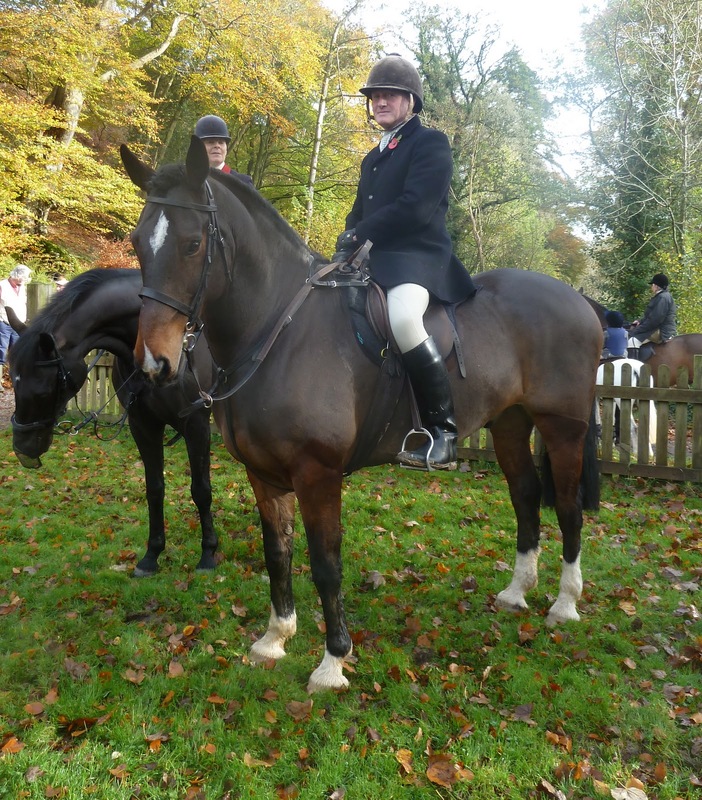 Taz and Paul went home yesterday (Edward said the barn is half empty without Taz -at 17.2hh - to fill up the space!) and a new horse, Solar, arrived so there will be lots more footage and updates on all of them over the coming week. ...well, not bad exactly, but certainly on exuberant form(!). The veterinary hospital are extremely pleased with the progress Paddy has made since his colic surgery last week and as you can see he is a whole lot perkier than he was this time last week! So yesterday he had the all-clear to come back to Rockley, which is fantastic but rather nerve-wracking(!). He is looking - and clearly feeling - terribly well and it will be interesting to see how well he tolerates the 4 weeks of box rest he needs for his surgery wound to heal fully. Fortunately he will be allowed out to graze in hand several times a day but he won't be allowed to do any "proper" work, even led from another horse, for the next month. Having taken him out in hand yesterday, I suspect that we will all find the next few weeks rather trying but still its a big improvement from this time last week, when Paddy was in a much less happy situation. He is now back in a box in the barn where the others can all come in and chat to him so he is getting lots of grooming from Taz and making faces at new boy Thomas, whom he regards as an alien intruder. I never thought shovelling sh*t for Paddy again would make me so happy! Glory be, and thanks to some bright little satellite whizzing around the earth's orbit, we are back online - yippee!! So far, so good, but I am really hoping that this new provider will be a whole lot more reliable than the previous bunch. We shall see. Anyway, that means that a whole load of stuff which has been sitting on my computer can now make it up onto the blog. First up is Paul, who will be going home on Sunday, 4 weeks after he came back. He was a rehab here almost exactly 2 years ago; more on him here. When he returned it was clear that - despite 2 years of being successfully barefoot - several things had recently gone wrong with his feet, possibly due to an injury he suffered, possibly due to trimming, possibly due to some other factor we may never identify. Although he has a robust caudal hoof and excellent hoof capsule, his landing had shifted in less than a month to being flat/toe first and his medio-lateral balance was off, resulting in lameness on his LF. As a result his frog had weakened - his heels may look high but in fact its his frogs which have atrophied. For me, there were 2 alarm bells when I saw his feet in October. He had laid down a ridge of sole and his feet were loading unevenly, weak on the medial side and overloaded laterally. Comparing his LF over the last 4 weeks, you can see how much rebalancing has gone on. His frog is now working properly again and is developing rapidly. 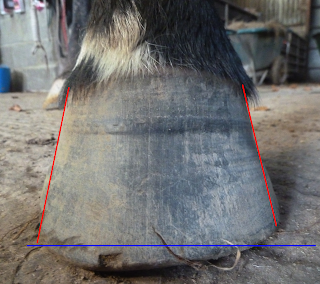 You can also see from this photo that at this stage, his bars and the ridge on his sole are absolutely crucial to the stability of his hooves - to trim these would be madness! Its interesting to see how much change can happen in a short time - particularly in his frog and his medial hoof (on the right in these photos). The speed of the change is at least partly due to the fact that Paul already had strong feet which were used to hard work - he just needed to be allowed to sort them out. Now look at the difference in his frogs - this is why - with him at least - it was a case of building frog, not lowering heel. I have not touched his feet with a rasp or nippers or a hoof knife. and the photo below is today. It doesn't take long if there is a good foundation in place. Both his owner and I thought that he would be quick to turn himself round and put himself back on the "virtuous circle" of a good landing which in turn will allow his medio-lateral balance to rectify itself; as he has done so his lameness has rapidly improved. As always, better biomechanics means healthier hooves - and healthier hooves means better biomechanics. I have a lot to catch up with, so there will be more soon. Lea was down to see Taz for one last time before he goes home next Sunday. We had one ride out in thick fog but a much nicer time the next day when it was mild and still. I decided that Lea and Taz needed a last Exmoor work-out so we set off to do some proper hill work. Edward came with us so we had Flynn and Paul out as well, both of whom found it very entertaining to be out somewhere new, even if the terrain was a bit of a challenge at times. Lea and Taz have a slight issue with potential decapitation by beech branches as Taz is WAY too tall to go underneath them. Luckily Lea has her high viz on so if she is left dangling 10 feet above the ground she will at least be easy to spot.